Birthday Party Ideas: Say Goodbye To The Old Ways! As a parent, having kids age-out of stuff can be a bittersweet experience. Sure, we want them to get out of diapers, but we find it hard to get rid of the baby clothes. We want to take off the training wheels, but we hate to see them growing up so fast. So when it comes to kids birthday party ideas, our thoughts go to the kids birthday party places we’ve been too before, whether for your own kid or when you dropped them off at the party of a friend. And the first thought is usually “indoor bounce house facility.” Kids have fun, they burn energy, and they can usually take care of themselves until they bounce around so much that they bonk into the forehead of another kid and get a bloody nose. But sometime around the age of seven kids seem to age-out of the bounce house idea (even though we, as adults, wish we could get in and bounce with them!) Kids still want the activity, but they see the bounce house as a little too “kiddy.” You might think Laser Tag, but that’s mostly running around for three minutes until they’re out of breath, followed by 10 minutes of walking past each other and wondering when it will be over. Good news! We’ve got the next logical step, and they’re going to love it! Our kids birthday parties are based on the American Ninja Warrior TV show, which just keeps getting more and more popular. 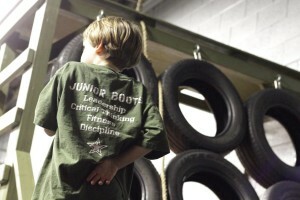 Our guided obstacle courses are so much fun that the kids won’t even realize that they getting exercise as they play! Plus, there’s that added thrill of competition as they see who can do it best. Have your kid’s birthday party in a place they’ll never forget…Hot Ground Gym!